Chadwick Boseman on the set of Black Panther. As a child growing up in South Africa, Debbie Berman always dreamed of being able to tell the sort of stories that people could connect with emotionally in order to help them escape reality. In time, what began as weekends spent convincing the other kids in her neighborhood to participate in home movies grew into a lifelong passion that led to her working on some of Marvel Studio’s biggest movies to date like Black Panther and Captain Marvel. Oscar season is upon us and I recently spoke with Berman about what it was like to be part of the team behind one of the most hyped movies in Marvel history (and a serious contender for Best Picture, to boot), as well as how her experiences as an editor have shaped her perspective on the industry over time. Besides her work on Marvel films, Berman edited the 2015 meta-horror The Final Girls, as well as the pilot of NBC’s Timeless. She explained that while the editing landscape, like much of the rest of Hollywood, is gradually becoming a more inclusive space, there’s still a long way to go. The key to really making a name for one’s self in the field, Berman said, is understanding the importance of hearing “no,” but never letting it deter your ambition. io9: Tell me about your origin story. Debbie Berman: I’m originally from South Africa, and I was one of those kids who was always obsessed with movies. When I was about 11-years-old, I used to spend every weekend with my friends making films and forcing all of the kids in the house to have starring roles, and it was always something that called to me.I loved the idea of telling stories and having people emotionally connect to them, or to be able to see them as an escape. It took me a while to manage to get to the States. I originally immigrated to Canada for a couple of years, eventually made my way to LA, and this has really just been a lifelong dream. io9: How did you get onto this track? Berman: [chuckles] There’s a six-hour version of this story, but the shorter version all boils down to being really, really focused on what I wanted to do and where I wanted to be. But also, and this is important, not being deterred by hearing “no.” And I heard “no” a lot. When I was interviewing for Spider-Man: Homecoming I heard a lot a lot of that, and I couldn’t let that get to me, and had to see it all as part of a larger, more exciting conversation about me working on Spider-Man. The fact that people were saying no was irrelevant because there was no way that I was going to stop fighting for myself. On the opposite end, I had to learn to understand the importance of saying no myself, and being very selective about the kinds of projects I wanted to take on—projects that would be good for my career, and not just for the money. It’s brutal, constantly tracking your professional momentum, and not necessarily seeing the kinds of results when and how you want for a long time. But you’ve got to surround yourself with people who are positive—people you can look to for inspiration and guidance along this path. io9: What made you gravitate towards these kinds of movies in particular? Berman: I feel like at this point in time, these are the films that are really talking to people, and I want to make films that people love and want to watch over and over again. They’re the kinds of movies you can laugh and cry at and just really have that full range of experiences all while you’re having fun. That’s what I feel the Marvel movies really do, and so I’m powerfully drawn to them. io9: What does the beginning of your creative process look like when you’re coming onto a Marvel film? How do you get into the groove of the project and then start crafting it into a narrative that makes sense? Berman: It’s interesting because in some ways, you’re behind the curve of everyone else and a lot of other people have already been directly involved in the project. They’ve already put time and energy into shaping the nuance of various scenes, but what I’m bringing at that point is a pair of fresh eyes, which is a gift. At the same time, you haven’t necessarily been a part of a lot of conversations about the film that have happened, and so what I try to do is to really get the footage to speak directly to me. I watch every frame of the dailies and, also the footage before action and after cuts in order to get a sense of the what the energy is like between the actors and the director in the moment. Between takes, when they’re just talking, I’ll pump up the volume and listen to carry that feeling over into the way a scene is edited. I do what I can to embed myself into the film because ultimately, it doesn’t really matter what everyone else has been discussing for months because the reality of the film becomes the footage that I get. It’s both what was intended and what randomly happened on that day, and I have to find the piece of that footage that speaks to me the most. “For a film that was so epic to have such a personal ending really resonated with all of us because it comes back to that idea of something being taken away, but ultimately being given back. It was powerful,” said Berman. For me, it’s about building familiarity with the material, finding the tone, and the style. Another thing, I’ll ask directors what their favorite films are and try to understand what’s important to them as a filmmaker. So for Ryan Coogler, he’s such a kind, warm-hearted human being, I really thought that he’d talk to me about these triumph of the human spirit films, but his favorite film is Jacques Audiard’s A Prophet, which is a very dark and gritty film. Another film he recommended was Andrea Arnold’s Fish Tank—which was sort of equally dark. And from that, I came away feeling that what Ryan’s really going for are movies that are about what make people tick. I took that with me into my editing and when I was working on a scene, I realized that understanding what made the characters tick would be core to telling the story the way he envisioned. io9: When you’re in the editing bay looking at all of the pieces to this massive puzzle that is the movie, how much of your own subjective creativity comes into play as your shaping the final product? Berman: Initially, for the first pass, I put 100 percent of my own perspective in, I don’t try to guess what other people want. I try to acquire data so that I have a basic understanding of what direction they’re leaning, but I go with what I want to see, what I find funny, what I find emotional. Because part of my job as an editor is to bring that to the table, just so that the director can almost see how a different perspective can bring some new insight to the end film. From there, things become much more collaborative. io9: Especially when you’re working with co-editors. Berman: Of course. With both Black Panther and Spider-Man: Homecoming, I was fortunate enough to have phenomenal co-editors. On Black Panther, Michael [P. Shawver] and I always watched each other’s scenes and would comment on them, give suggestions. We really provided each other with another set of honest eyes. The amazing thing about Ryan Coogler is that, well he’s a genius, but he was always completely open to our interpretations of the work. If Michael and I felt a certain way about something, and Ryan felt another way, he’d usually go with our suggestions because he trusted us and honored our instincts. io9: How do you contribute to the visual language of a film through editing? Especially to amplify the textual elements of the film’s story that we get through dialogue, for example? Berman: A lot of that comes from whose perspective you’re editing from at any given moment. Take that first Warrior Falls scene. Initially, there was a whole opening to the scene where T’Challa wasn’t even there, and it was just Zuri explaining to the tribes what was about to happen. You meet everyone standing there, and it was a couple minutes-long opening, and it was great, but watching that first cut, we realized that we needed to see this all through T’Challa’s eyes, from his perspective. So we cut out that whole opening and now we arrive with him at Warrior Falls. We stay on his back as he’s leaving the ship, and then we see the tribes at the same time he does, and so what he’s seeing there is what’s really dictating the visual language of how that scene evolved and what to show where. His emotions are what tells me when to cut to a super-wide shot, because he feels the epicness of what he’s seeing and you should as well, but then we cut to close-ups of his family’s face to make the scene feel emotions, too. One of my first instincts was that the ending of the film wasn’t the right ending, and it’s something I spoke to Ryan about quite a bit, but it wasn’t really about convincing him. We had this really great ending that worked well where T’Challa gives this beautiful speech at the United Nations—it was originally much longer—and that first cut was really well received. Everyone enjoyed seeing T’Challa standing there powerful and triumphant, but something in my gut told me it wasn’t right. As an editor, I don’t always know what the answer is, I just sometimes know that I need to keep nudging people. So I spoke with Ryan a few times, and he agreed with me, and he started thinking about what the ending of the film needed to me. It seems so obvious now when you see T’Challa and Shuri in Oakland, but I’ve found with filmmaking, sometimes decisions that seem obvious actually take you quite a while to come to them. But at the time, when we were looking at the whole film, it was really difficult, but Ryan disappeared into his office for a few days and came back out with this beautiful scene set in Oakland. For a film that was so epic to have such a personal ending really resonated with all of us because it comes back to that idea of something being taken away, but ultimately being given back. It was powerful. io9: We’ve gotten to a point where there are pushes for more representation both in front of and behind the camera and in writers rooms, but what’s it like in the editing bay? Is it a field that’s still predominantly white and male, or is that changing? Berman: I think the editing field might be slightly better? I try to hire a diverse mix of people, and I think sometimes the change that can start to happen will be—people will begin to hire more women, but they hire them in really low positions, and there’s no clear path upwards. So, I go out of my way to make sure that people are hired in key positions—for example on Captain Marvel, our two first assistants are women, which is phenomenal, and our second assistants are guys, and we make a wonderful team. io9: What’s been interesting about editing Captain Marvel? Berman: It’s been interesting working with a team of directors, it’s something I hadn’t experienced before. It’s also cool to be working on something set in the ‘90s because it’s such a fun era and there’s a lot of nostalgia [to be] created with that. 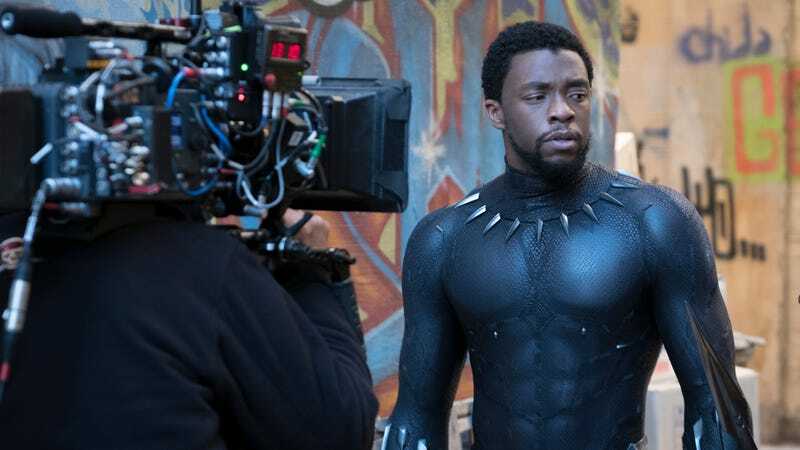 Black Panther is returning to theaters next month, the 91st Academy Awards air on ABC on February 24, and Captain Marvel hits theaters on March 8.